This small town in recent years had achieved fame as Dwithieya Mantralaya. The town has an interesting history. During the period of the Vijayanagar Emperors, this town was famous for selling gold and gold coins on its streets, Hence, its name Honalli. Honalli today is a small town, 50 kms from Shimoga. It is located in Davangere district. The town has many religious institutions and maths but the most famous is the Raghavendra Swamy Matha. The matha is set amongst picturesque surroundings on the banks of the Tungabhadra. Incidentally, Mantralaya too is on the banks of the Tungabhadra. 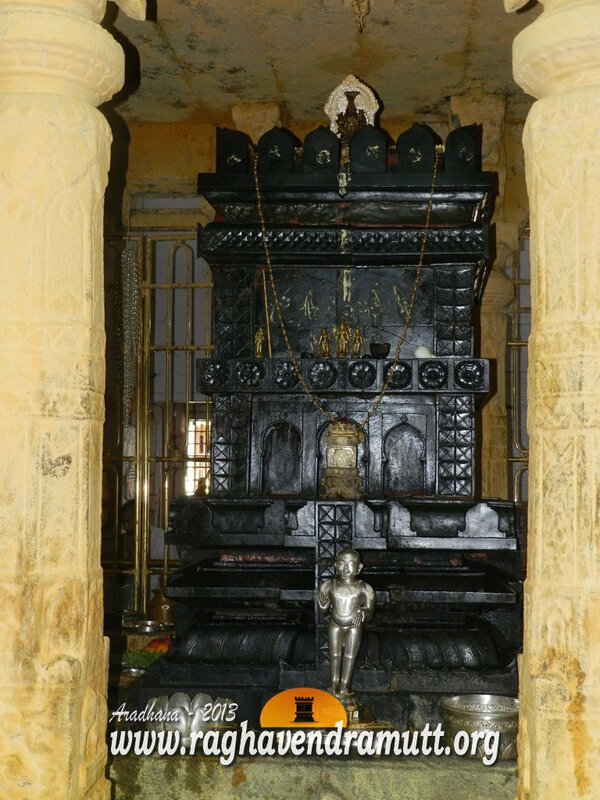 The matha has given Honalli the name Dwitheya Mantralaya as it is believed that Raghavendra Swamy himself came and did the pratisthapane of the Brindavana. The Brindavana here is believed to be more than 300 years old. The people who wanted to construct a Raghavendra Matha were coming in a procession from Mantralaya, carrying the Mrithike from the Moola Brindavana. The people saw an aged person in holy robes going into the matha and never returning. He is believed to be Raghavendra Swamy. Even today, you can see the Thate (plate), Hanuman idol and other paraphernila that Rayaru himself brought to Honnali. All these things can be seen before 9 a.m., every morning. The contact mobile telephone number for Honnali matta is 9880917328 (Sri Raghavendra). He is very helpful. The matha has seven rooms and also a Kalyana Mantapa for performing functions. It is advisable to call up the matha if you want Theertha Prasada and accommodation. The matha will take care of all your pooja and seve arrangements. Apart from the Raghavendra Swamy temple, Honnali has several religious structures. The Tuggalahalli Temple and Thirtha Rameshwar temple of Shiva are worth a visit. The moola Brindavana of Bidarahalli Sreenivasa Theertha (1590-1640), a sanyasi of the Uttaradhi Matha, is also located here. Bidarahalli Srinivasa Theertha was a contemporary of Rayaru and he was a noted Madhwa scholar. Raghavendra Swamy met Bidarahalli Srinivasacharya in Bidarahalli near here and appreciated his works. It is from the time of Srinivasacharya that the Rayaru Matha uses mustard during Chaturmasa. This story is too well-known to bear any repetition here. It is believed that in his later avatar he became Jagannatha Dasaru, the author of Sri Harikathaamrutasara. Some of the important works of Srinivasacharya are Srimanyaayasudha, Tatvaprakashika, Dashaprakaranateeka, Pramanapaddati, Bhagavatha and Rugbhashya. What Vadiraja means is that instead of going with difficulty to places like Kashi, Gaya, Prayag (Ahallabad) and Badari, you can come to the Tungabhadra and it will give you the same sanctity and holiness. The Tungabhadra flows right in front of the Matha. You can take bath there and perform seve or pooje at the matha. Kooldi is near Honnali. This is the place where the Tunga meets the Bhadra. By the way, the Udugani Sri Raghavendra Swami Mutt, which is considered to be the Trutheeya Mantralaya is near Shikaripura in Shimoga district. Shikarapura is near to Honalli. People will tell you that after Rayaru disappeared into the Garba Gudi at the Honnali Rayara Matha, he came next to Udugani with the same set of articles and once again disappeared into the Garba Gudi, never to be seen again. Udugani is also the birthplace of Akka Mahadevi, the famous Vachana poetess and a woman saint. The temple town of Balligavi is nearby. It is just seven kms from Shikaripura. There are Rayara Muthas at Shimoga, Bhadravathi, Hosanagara, Teerthahalli and Davangere ofcourse. Honnali is taluk headquarters and reaching the town is easy. If you are going by road, go first to Shimoga and from there Hobnnali is nearby. You can also take the railway route.Peole from Bangalore and Mysor will have to get down at Harihar and take a bus from there to Hoinnali. The bus stand at Harihar is adjacent t the Railway station and there are plenty of buses leaving for Shimoga via Honnali. The distance from Harihar to Honnali can be covered in 45 minutes. The Janashatabdi Express and several other trains stop at Harihar.